We spent the last week researching customer reviews, both bad and good, then we signed up for one of these penny auctions sites ourselves to find out how they actually work. The short answer to the question "is quibids a scam" is NO. Well, not exactly. If you actually take the time to read the fine print and learn about the service, you'll know exactly what you are getting into and your expectations will be appropriately low. On the other hand, in our opinion, most people will probably not read the full fine print and will therefore end up losing money on penny auction sites. We did. The "scam" question is a really tough one to answer because while their commercials portray a world that probably does not exist, their fine print is actually pretty clear. I drink a lot of beer and I have never been ambushed by a group of gorgeous bikini clad women immediately after opening a can. So does that make Bud Light a scam? The penny auction sites aren't necessarily being dishonest, but they are being "selectively honest" on what happens in reality for the average person (based on our experience and our research). Most people will never experience what the commercial portrays (aka you will NOT get an iPad/MacBook/iPhone for 95% off). The first thing you need to understand is that "penny auction" sites might as well be called "penny raffle" sites. The auctions go up by one penny bids at a time, but each "penny bid" actually costs between 25 cents and $1. In other words, let's say each bid on a particular item costs 25 cents. If an iPad is going for 99 cents and you raise the bid by "one penny" to $1, you've actually just spent 25 cents. You are paying 25 cents to place a bid. In a more standard auction, it costs nothing to raise the bid. If you raise the bid on a $200,000 vintage Ferrari to $210,000, it does not cost you anything unless you win. Imagine an auction where you had to pay a $1000 fee just to raise your bid on the vintage Ferrari, and if you get outbid, that $1000 fee is gone forever. That's how sites like quibids work. You spend 25 cents for the ability to raise to the auction from 99 cents to $1. Then someone else raises it to $1.01 and your 25 cents is gone. And so on for as long as the auction lasts. If that's not annoying enough, most penny auction sites extend the auction time every time a new bid is placed! But who cares if you have to bid even 100 times at 25 cents a pop to win an iPad that's worth $700??? In that scenario, yes, you would have spent $25 on bids, plus whatever the final auction amount rose to, and the combination would be far less than $700. But in reality, at least in our experience, this does not happen, EVER. First of all, when you sign up for these sites you are required to purchase a pack of bids. For example, you might have to buy 100 bids for $60. When we signed up for one of these sites, we had to buy a $60 pack of bids. On our first day we spent roughly $40 bidding on a iPhone but eventually dropped out as the auction became more expensive. We only had $20 worth of "bids" left so we tried some less expensive items like a $20 gift card but pretty soon we totally wiped out our credit. At this point we decided not to re-up. Our experience felt more like gambling in Vegas, not a legitate auction. 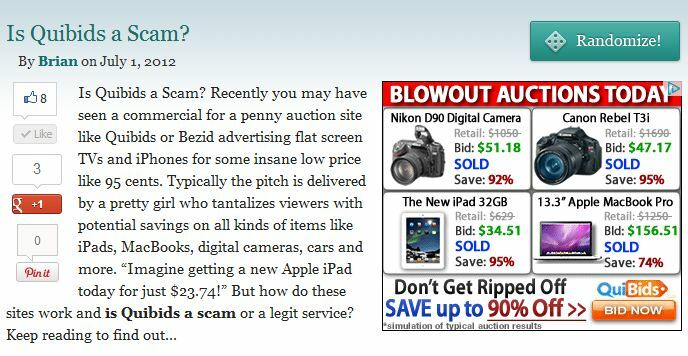 How can the penny auction sites afford to sell an iPad for $25? Assume each bid costs $1. It will take 2500 one cent bids to reach the selling price of $25. So the auction site has made $1*2500 + $25 = $2525 for an iPad that probably costs around $700 out the door. We also came across several reviews that claimed penny auction sites use artificial bidders to drive up the auction price on the better items. There were other negative reviews that carried some seriously negative and scary accusations when it came to credit card fraud and other unethical business practices with some penny sites. So buyer beware! One thing that Quibids and all the similar auctions sites have definitely mastered is the art of Search Engine Optimization (SEO). SEO is the skill that websites use to rank highly in google for various search queries. Sites like Quibids must have anticipated that lots of people would see their commercials and then search google for "Quibids scam, quibids legit, quibids review" etc… to find out the scoop. Quibids has employed SEO tactics to make their own legit looking review sites dominate the first and second result pages of google. Not only do these sites give Quibids a glowing review, they also (brilliantly/unethically) offer the visitor a free coupon code for the site at the same time they are praising the service. I can't say I blame Quibids, I would do the same exact thing. As with anything in life, if something sounds too good to be true, it probably is. In our opinion, Quibids is not scam but we also don't believe you will have the experience that is portrayed in their commercials. But if you're curious, do some research and try one out for yourself. After all, we are still waiting for that gaggle of bikini clad women to appear from thin air when we open a beer! Immediately after publishing this article, we got a ton of awesome feedback from people who had bad experiences with penny auction sites. We also realized that in an ironic twist, when most people read the article, they will very likely be automatically shown an advertisement for Quibids right in the middle of the page. This is because our ads are powered by Google which does an incredible job of matching the content of our site with contextual (relevant) ads. Just wanted to point this out so you don't think we did that on purpose, it's out of our control but pretty funny!